Industry lightest, most portable and innovative Desktop microphone. The Laptop and Tablet Microphone Solution. The SpeechWare TravelMike, the new Laptop and Tablet Microphone Solution. The TravelMike is excellent for portability and you can avoid the cyborg look wearing nothing at all. 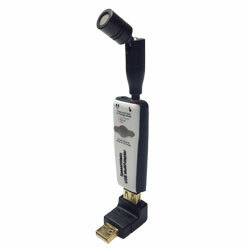 Similar performance as the award-winning TableMikes in an industry first small USB module. Dual funcionality: Long-range and variable dictation distance (up to 50 cm or 20") with very high accuracy, under Green LED meant for the TravelMike, and Normal mode for VoIP and Voice recording applications under Blue LED. The SpeechMatic USB MultiAdapter connects to the special 90° fixed or 180° pivoting USB upright adapters as well as a short mini boom, to become the industry first TravelMike for Notebooks, Ultrabooks and Tablet PCs. 3. The 90° fixed and upright USB connector, compatible with any Notebook, Ultrabook or Tablet PC.